This is the third installation of the MasToChef Homme Project. Mas and Chef are on a roll and while it may be obvious what they are up to, there is no telling how they will plate their final dish. The above is the design Mas handed to Chef for his interpretation of the Net/Net colorway of the Air Yeezy 1 atop the LeBron X+. Chef will not take this recipe into the GourmetKickz Kitchen and cook them into reality on demand as eager gluttons place their orders. Each design will only be available for a limited time. Remember each Homme Project package comes with custom insoles, a custom matching shirt designed by Mas and featuring the iconic GourmetKickz “now serving” logo, a custom box also designed by Mas, custom hang tags, and a collector / story card. After the jump you can purchase this pair of customized LeBron X+ from The MasToChef Homme Project, and perhaps you will think to grab one of the other colors while they are available. By now you have figured out that MasToChef means graphic artist and sneaker enthusiast Mas designs the custom and passes these ingredients to Chef for the cooking. In their first shoe collaboration project, entitled “The Homme Project” Mas and Chef decided on the LeBron X as the base, and are using the Air Yeezys as themes. When will it end? Who knows! 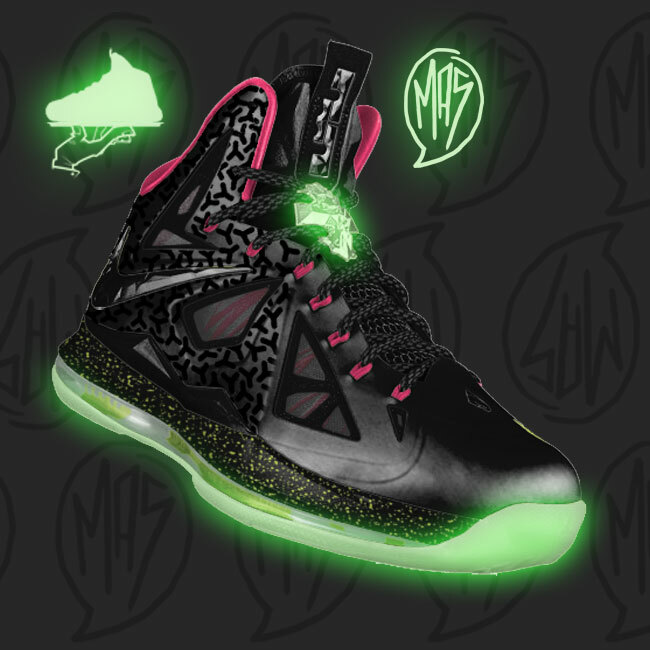 Thus far you have seen the Zen colorway of the Air Yeezy 1 reinterpreted on a LeBron X and now revealed is the breathtaking “Blink Yeezy 1” colorway on a LeBron X. After the jump you can see the matching t-shirt and insoles and read about all the extra goodies included in the package. Hurry to checkout to book your personal pair as these limited packages will not be available for long. “Homme” meaning man in French, and Man being represented by the XY Chromosomes, X representing the LeBron X, Y represening the Air Yeezy, the french term Homme being selected due to Kanye West’s connection with French Luxury Brand Louis Vuitton. See what just happened right there? It gets better! “MasToChef” represents the collaboration of graphic artist (and Creative Director of Ronnie Fieg’s KithNYC, designer of the Asics “Salmon Toe” & “Leatherback” wooden laser etched boxes) Mas and Chef of GourmetKickz. 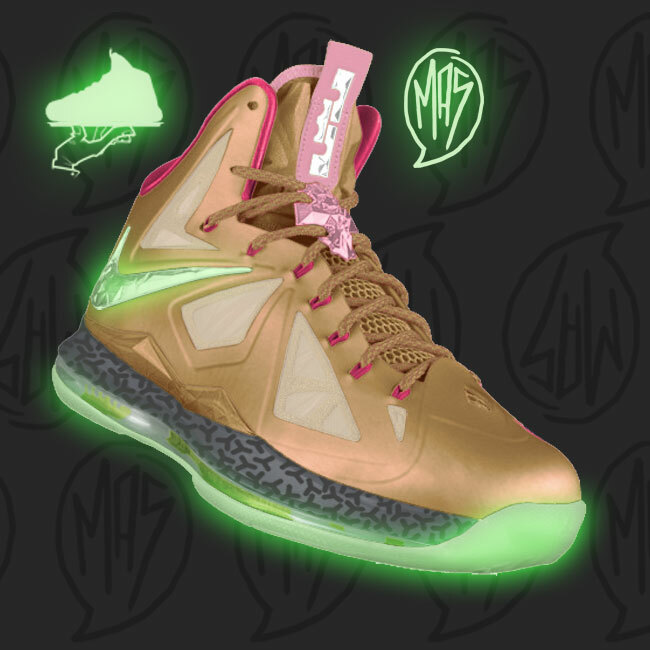 Mas creates the designs in this project and passes them To Chef for creation in the GourmetKickz Kitchen. MasToChef also sounds like MasterChef, no coincidence there either as these dishes are certainly of MasterChef Calibre. After the jump purchase the first shoe to launch in the series and see images. 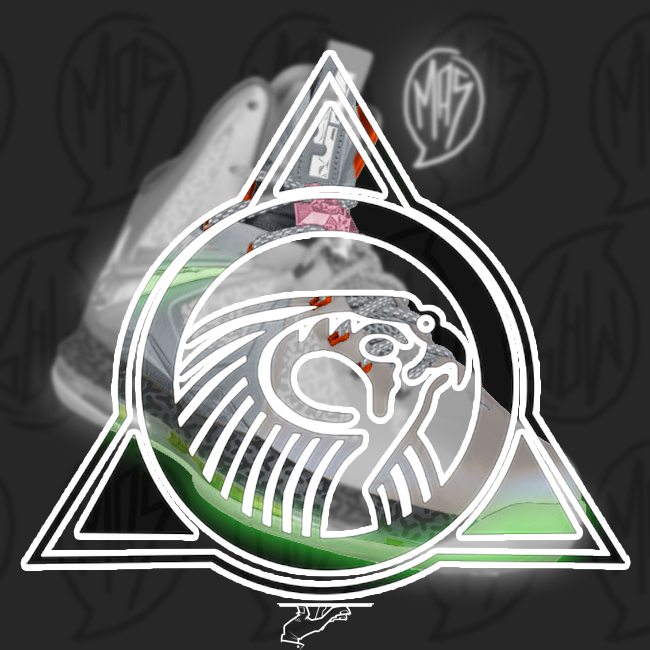 As this image eludes, something unprecedented for GourmetKickz is on the horizon: A collaboration between graphic artist Mas and Chef of GourmetKickz will give birth to an entirely new series of custom GourmetKickz, announcing “The MasToChef Homme Project”. On 10.11.12 I announced my intent to update some of my favorite customs from the LeBron 9 series onto the newly launched LeBron X (10). Since the LBJX just hit ID, there could be no better time to do this. 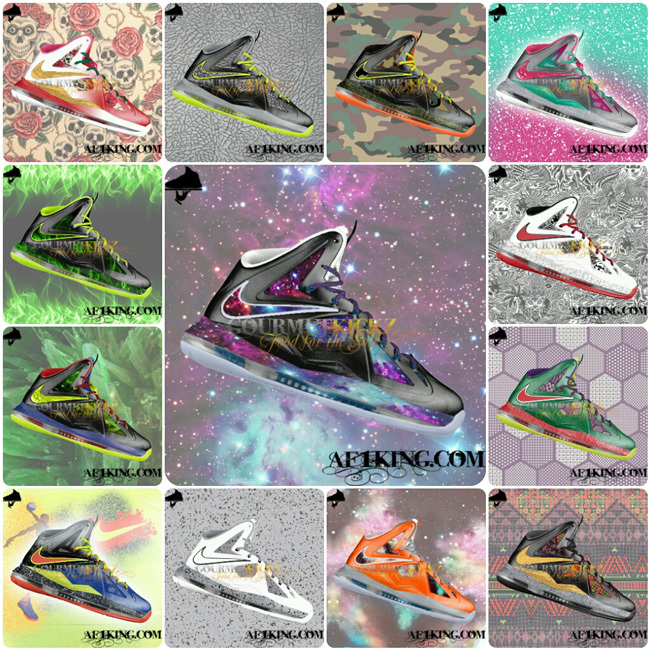 The custom pieces I chose to update include some of my all time favorites, best sellers, and a couple of designs that were either scrapped or never executed on the LeBron 9. Above is a snapshot of the first 13 in this series, and among them is a Nerf, as well as my famed “King of the Galaxy”. Some of these will be limited, others will remain open stock catalog items. Order now and receive your custom within 3 months. The cost of the NikeID shoe is included in the total list price here on AF1King, so I will handle all ordering from NikeID. Remember ID takes 4 weeks, so part of that 3 month wait is due to Nike’s build time. Enjoy! Those who have been following the progression of the Nike Zoom Rookie LWP recall that it entered the scene with a couple of great colorways. Two very memorable colors were themed for Halloween; the HOH Exclusive Black / Max-Orange release and the Luminous Pearl colorway. The above takes elements of both of those kicks and combines them in a very unique way. The base all black rookie is transforme in the following manner; the sidewall pods are painted pumpkin with creme colored glow in the dark craters while the sole, mesh and accents also glow. The result is a mean, clean, kickass custom for Halloween! Check out more images and place an order after the jump. 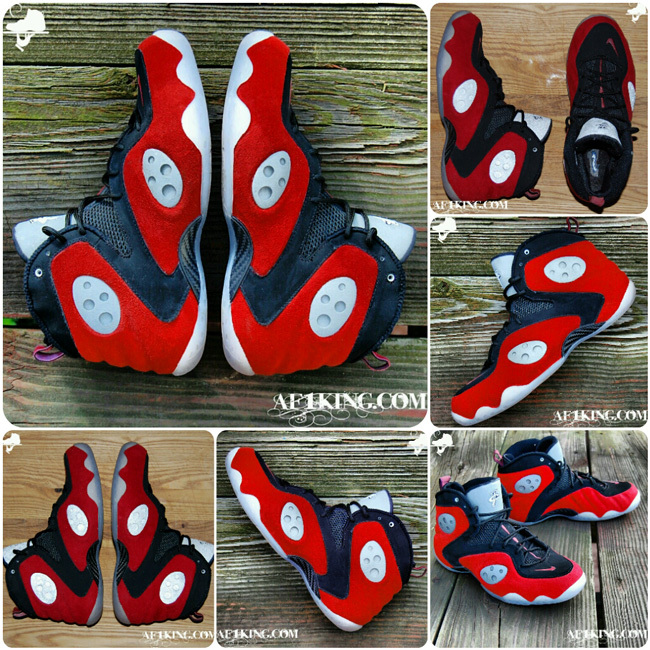 Prices include the Black Zoom Rookie, check the “Send in Your Rookie” listing to pay for just the artwork. Orders placed before 10/10/12 are nuked in the GourmetKickz Kitchen for shipment in time for Halloween! Fall is upon us and so with the month of October comes pop-up costume shops, Halloween decorations, blow up lawn goblins, and loads of other spooky delights. In the spirit of the season I decided to cook up a dish of the pumpkin variety, in two distinct versions as shown above. 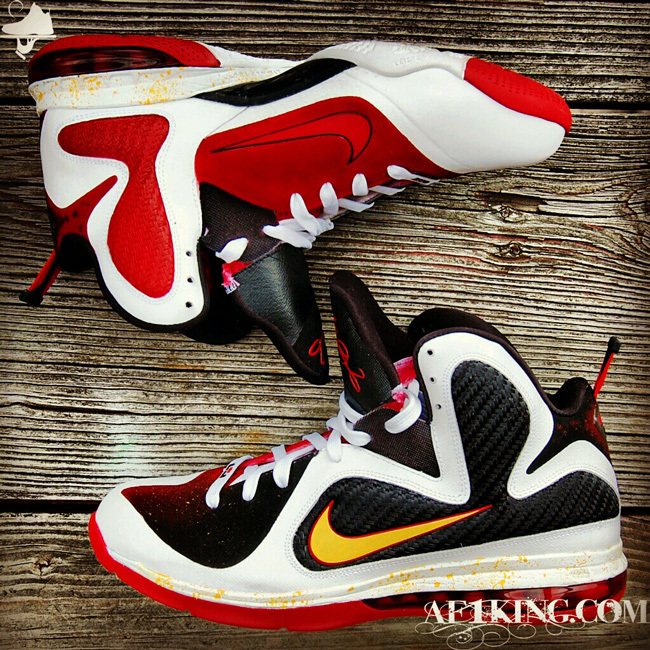 The first is a very clean Pumpkin / Black – Creme colorway. 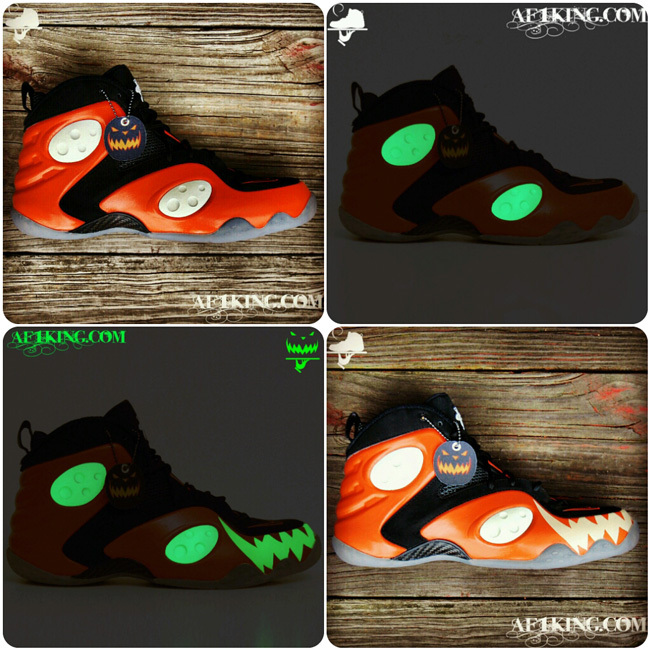 A black Zoom Rookie is used as the base, the foamposite portions painted a robust pumpkin color, and sidewall pods are painted creme and treated further to glow in the dark. The second version features a Jack O’Lantern-like upgrade to the frontal area of the shoe. 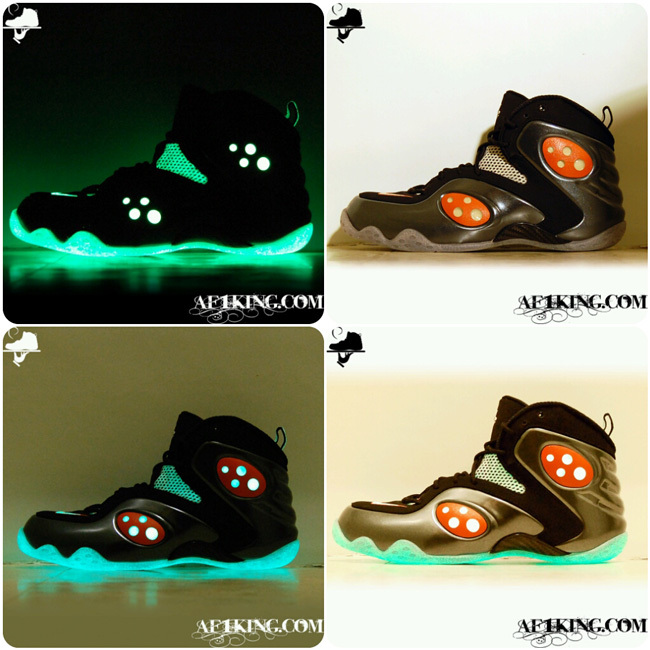 A creme colored angry pumpkin mouth is painted on the front and made to glow in the dark. The result is a very ominous dish indeed! See more images after the jump and purchase your pair before the 10th to receive in time for Halloween. I conquered cancer over 20 years ago, and everywhere I turn I either see people battling the disease, suffering the loss of a loved one to the disease, or helping someone with the disease. Breast Cancer remains one of the leading diagnosis of cancer among women. As a man and a cancer survivor it is mandatory that I support awareness of this disease. The artwork is simple, a shoe painted pink, the sidewall spheres are treated to reflect light, the light representing the light of hope. Let us shine a light on Breast Cancer research and support the search for a cure. I don’t care if you share this post, take the picture, instagram it, retweet it, make a facebook photo, or buy the shoe. Just do something to raise awareness. 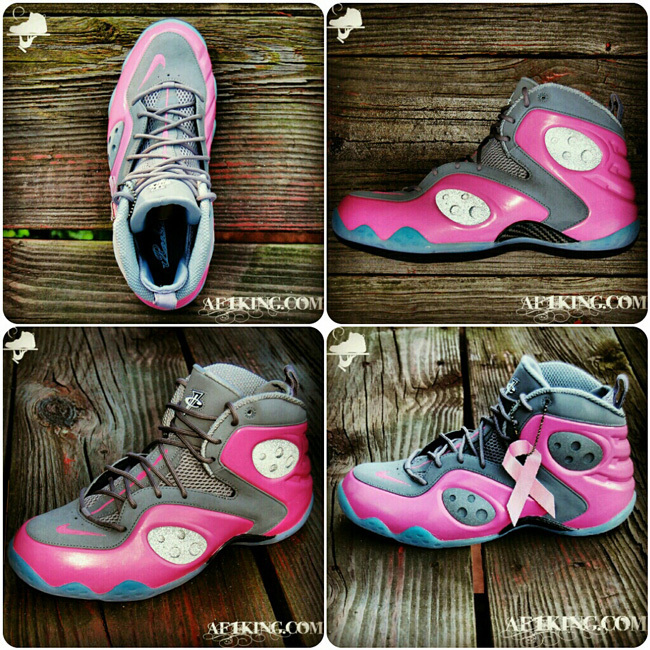 If you decide to purchase the shoe, $100 of the fee is donated to The National Breast Cancer Foundation via StayClassy.org. See more pictures and purchase a pair after the jump.